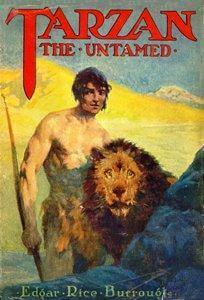 Tarzan the Untamed , Burroughs' seventh Tarzan novel, was his most controversial because it demonized Germans. Set during World War I, published in 1919, it's about the ape-man's revenge against the enemy invading Germans who destroyed his plantation and killed his wife in British East Africa. An angry and particularly violent story, perpetuating stereotypes of the Germans, meant dwindling book and movie sales in Germany henceforth.